I have a list of things I plan to do in the year but it's such a pain to transfer it from Word to Blogger I just decided to make a page that I update when I'm done each project. 2. Mini Rag Quilt for kitties. I have a lot of leftover squares from when I did my giant rag quilt a couple years ago so I decided to use a few to make the cats a cozy rug to sleep on. It currently lives in an old shoe box that Sita loves to lay in and destroy lol. 4. Hexipuffs! This is more of a huge Work In Progress (WIP) but I am happy I started it, these little cuties are so much fun to knit. 5. Crochet Purse. This wasn't really a complete project, I just finished it. However I'm so happy I finally finished it! Now I have no idea what to do with it LOL. 6. 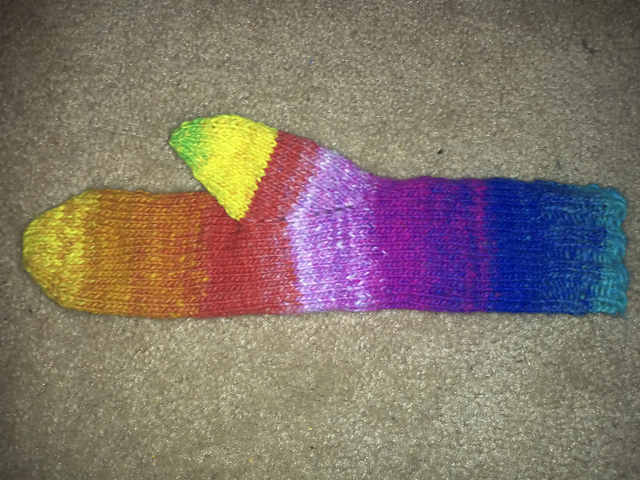 Ruba'iyat Mittens. I took a class to make these and I am SO happy with the result. 7. Seraphina Shawlette. I ran out of yarn so I decided to make this into a shawlette, that was a great idea I love wearing this. 8. Cat blanket for SPCA. I'm trying to make a few blankets to donate to the SPCA. While waiting for my needles I decided to use some old granny squares I had laying around and make them into a blanket. 9. Musica Gloves. Made these for my friend Michelle who is studying music at University.